In our commitment to help you select the best product that will complement your skin type, we have reviewed 5 of the hottest toners designed for combination skin. These toners were then thoroughly reviewed based on ingredients, compatibility on the skin and friendliness on the budget to pick the best toner for combination skin. Skin Food’s Peach Sake Toner is a toner that comes in lotion form. Rich in antioxidants, it helps stop the signs of aging, brighten the skin, and boost the skin’s rejuvenating effects. A pumpkin wine-based toner, the Nutrient Toner by PCA gently exfoliates and refines pores for a healthy glow. It also has Aminoguanidine, an ingredient that promotes soft and supple skin. Enriched with AHA and BHA, COSRX’s AHA/BHA Clarifying Treatment Toner removes dead skin cells and deeply cleanses the pores. It also contains allantoin for smooth and moist skin. The Hawaiian Facial Toner by Alba Botanica promises radiant and poreless skin with its plant-based ingredients. It helps balance the skin’s natural pH level, and is 100% vegetarian. We think this is the best drugstore toner for combination skin because it features rice sake and peach extract as its main ingredients. Sake facilitates blood circulation while its alcohol content controls oil production and tightens pores. Rich in Vitamins A and C, peaches reduce signs of aging caused by free radical damage. Additionally, our skin acids help stop acne and and repair acne scars. The organic acid peaches contain help boost the skin acid’s rejuvenating effects. Another addition to this toner is pectin. A form of fiber present in the skin of peaches, this ingredient helps in toning and firming the skin to give that youthful glow you’ve always wanted. Through its fermentation, sake produces kojic acid, a known skin brightener. Peptides, found from the yeast used in the process, work by boosting the production of collagen. What’s great about this product is that it comes in lotion form. This is something you wouldn’t expect from a toner, but we think it makes application more fun. If you are struggling with aging combination skin, this one’s a good product to invest in because it is rich in vitamins and amino acids. It also exfoliates and reduces the appearance of pores for a youthful, healthy glow. This product boasts of being pumpkin wine-based. Produced by fermenting whole pumpkin, pumpkin wine is full of natural benefits including Vitamins A and C.
These vitamins, when applied topically, can help fight the si﻿﻿gns of agin﻿﻿g. Another key ingredient of this toner is Aminoguanidine, which helps keep skin supple and soft. It also has lactic acid, an ingredient naturally found in sugars and milk, helps moisturize the skin. Alpha hydroxy acids and other natural enzymes are also its key ingredients. Essential in skincare products, they help in removing dead skin cells and debris that cause clogged pores. This results in smaller pore size and a more refined complexion. Full of skin-strengthening ingredients, it retains the skin’s moisture content without the dryness. It provides the skin with essential nutrients, so a balanced complexion is all you’re left with. This toner has AHA and BHA as its active ingredients. These two contribute to clearer skin by removing dead cells and clogged pores. Willow bark water and apple fruit water also make its way to its ingredient’s list. The former has astringent and anti-inflammatory properties, while the latter is known mainly for its fragrance. It also helps remove blackheads and whiteheads. This product helps in evening out skin tone by removing blemishes to reveal a younger-looking and more radiant-looking you. Instead of purified water, this product makes use of mineral water. The natural volcanic bedrock water from Jeju (South Korea) is said to offer more health benefits to the skin. Allantoin is another ingredient we found impressive. This provides nutrition and moisture for smooth and moist skin, so for those with issues with dryness and flakiness should give this a try. Non-sticky, what we really like about this toner is that it keeps its ingredients to the minimum. It also comes in a spraying nozzle, which we think is great as the concept makes it more hygienic. Being a plant-based, naturally-derived product make this a great toner for combination skin. It helps maintain the skin’s natural pH, so what you get is skin that’s refreshed and evenly toned. This toner has hibiscus, honeysuckle, guava, and cucumber as its main ingredients. These four main ingredients purify and hydrate skin, while Aloe Vera and Witch Hazel help refresh the skin. This product also contains allantoin. Great for dry skin, this ingredient is often used as a moisturizer to treat or prevent minor skin irritations. What we really love about this toner is it promises immediate results—a reviewer even said she started seeing results the next day itself. It deep cleans the skin without leaving it dry or tight. Using this toner feels like spending a day in paradise. Doesn’t its bold and colorful bottle design make you want to have a vacation? What makes this the best toner for combination skin is that it is packed with Vitamin C. Vitamin C helps restore the skin’s strength and firmness, and helps the skin naturally repair itself. For normal and combination skin, this helps hydrate the skin and reduces hyperpigmentation. Unlike most toners, this product comes in a spray nozzle. This is brilliant because it makes it more hygienic, but caution must still be observed as the mist can accidentally get in the eyes. An amazing ingredient to this product is white tea. Said to be better than green tea, it helps prevent DNA damage due to the sun’s rays and can also help prevent premature aging. Aloe Vera is another impressive feature of this product. This ingredient effectively oxygenates and hydrates, balances the skin’s natural pH, and boosts circulation for healthier-looking skin. This toner also uses BioActive 8 Berry Complex, which contains of organic berries like acai and sea buckthorn berries. These promote healthy cell turnover and strengthened dermal immunity. The first step in every skincare routine is to find a gentle cleanser. For combination skin, it is recommended to use a foam or gel cleanser, both of which offering mild action. Fragrances, and other ingredients that cause skin irritation, should be avoided. You should also stay away from bar cleansers, as they can cause clogged pores and leave skin dry and irritated. Toning should be the next step, as it can help in repairing the skin. In choosing a toner, avoid ingredients that can be possible irritants such as witch hazel, alcohol, or menthol. Toners containing fragrances, whether natural or synthetic should also be avoided. The same goes for toners containing citrus oils, as they are equally irritating as well. It is best to go for toners that contain antioxidants, or those that have skin repairing properties. Sunscreen should also be included, as combination skin is just as sensitive to the sun. Opt for products that contain titanium dioxide or zinc oxide, as these provide UVA and UVB protection. Next is exfoliation, as it can help in the removal of dead skin cells. For this step, you can choose between these two categories: products that contain salicylic acid, and those with glycolic acid. Products with salicylic acid work better because of their deep exfoliating properties and their ability to minimize pores. These also help clear clogged pores and kill bacteria that cause acne. Moisturizing is also crucial, but you’ll need two separate products for this one. For dry areas, apply cream with moisturizing qualities, and a lightweight one for the T-zone area. Before wearing makeup, another step to be considered is to apply a hydrating serum or primer on the entire face. Next to oily skin, we think those with combination skin will benefit the most from toning. While it controls oil production in the T-zone area, it generally balances out the appearance of your skin. 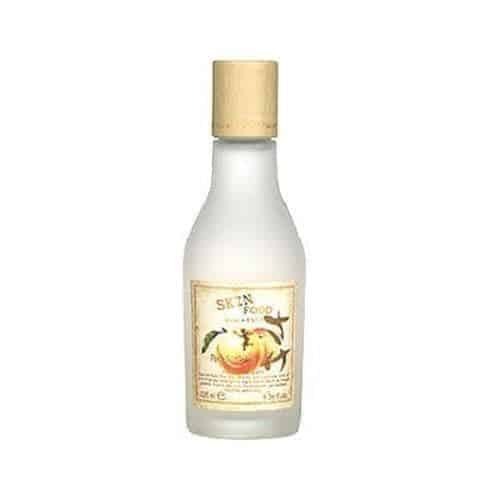 We have chosen the Peach Sake Toner by Skin Food as the best toner for combination skin. This toner comes in lotion form, is lightweight, helps control shine and is great in shrinking pores. A break from the usual liquid toners, this product is easily absorbed by the skin and does not leave a greasy feel. It also has a mattifying effect and has a sweet peach fragrance to it.